The five players who grace the 2017-18 All-EuroLeague Second Team presented by 7DAYS were each responsible in their own way for making history and treating fans across Europe to magnificent displays of basketball this season. They had their hands in some of the record-breaking feats and remarkable team accomplishments that made this season one to remember. After voting by fans and accredited media members, Paulius Jankunas and Kevin Pangos of Zalgiris Kaunas, Sergio Rodriguez of CSKA Moscow, Alexey Shved of Khimki Moscow Region and Vassilis Spanoulis of Olympiacos Piraeus have been named to the All-EuroLeague Second Team. While three players – Jankunas, Pangos and Shved – are making their first appearances on the All-EuroLeague team, Rodriguez is making his second and Spanoulis has set a record with his eighth appearance on the team, surpassing Juan Carlos Navarro of FC Barcelona Lassa. Jankunas and Pangos give Zalgiris their first All-EuroLeague selections since Darjus Lavrinovic was such honored in 2006. Media voting counted for 75% and fan voting 25% of the totals used to determine the All-EuroLeague selections. The All-EuroLeague Second Team is the last of a series of honors announced this week. The EuroLeague MVP will be named at the 2018 Turkish Airlines EuroLeague Final Four in Belgrade. The Alexander Gomelskiy Coach of the Year Trophy and the Gianluigi Porelli EuroLeague Executive of the Year are post-season awards. 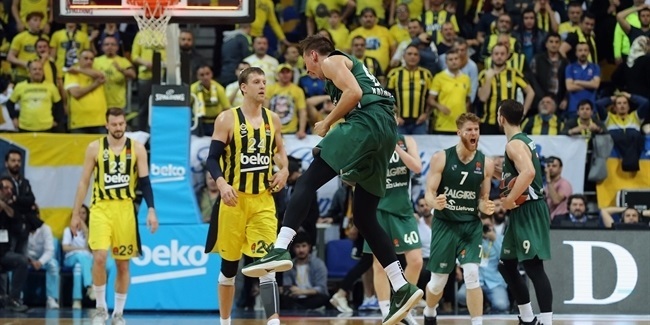 Zalgiris Kaunas ended its lengthy EuroLeague Playoffs drought this season and will finally return to the EuroLeague Final Four. The man at the center of it all for the Lithuanian champion was team captain Paulius Jankunas. The 34-year old power forward has done so in style, too, putting together one of the best among his 15 EuroLeague seasons, of which all but one have been in a Zalgiris uniform. On a team committed to playing team basketball, Jankunas not only served as a leader, but was Zalgiris's second-best scorer (11.4 ppg. ), top rebounder (4.9 rpg. ), and had the team's second-highest average PIR (13.9). His 24 points and PIR of 36 in Round 2 at Khimki Moscow Region and his 11 rebounds in Round 14 at Valencia Basket all set or matched season-high performances by Zalgiris players. 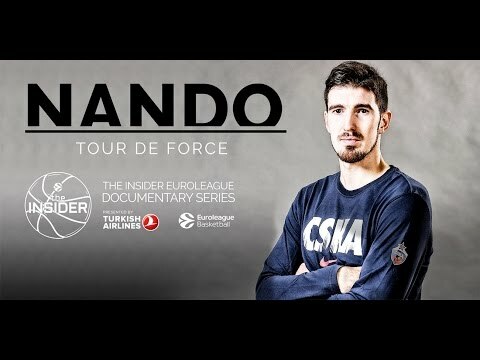 Jankunas's 83.3% free throws accuracy during the EuroLeague campaign ranked second among all big men with more than 70 free throws attempts as did his 88 free throws made. During the season, which is his eighth consecutive with Zalgiris, he was chosen as the league MVP for December and became the EuroLeague career-leader in defensive rebounds. Just before he heads to Belgrade for his first Final Four, Jankunas can take pleasure in being chosen to the All-EuroLeague team for the very first time in his long and memorable career. Zalgiris Kaunas has reached the EuroLeague Final Four for the first time this century and a lot of its success has had to do with point guard Kevin Pangos's outstanding season. At age 25, Pangos has shown great maturity, hitting clutch shots and using his poise and high basketball IQ to lead Zalgiris's extra-pass offense close to perfection. An accomplished scorer, Pangos hit 73 of 155 shots from downtown (47.1%) in helping Zalgiris become the best three-point shooting team in the competition (42.4%). Pangos ranked 11th overall in three-point shooting percentage and was second in assists (6.0 apg.). He delivered nearly one-third of all Zalgiris assists this season while also leading the team in scoring (12.7 ppg.) and performance index rating (14.1 PIR). In his second season with Zalgiris, Pangos improved in almost all aspects of the game, nearly doubling his assists average and two-point shooting percentage (from 28.4% to 47.7%) and helping more on the boards (from 1.8 to 2.7 rpg.). Pangos was especially dangerous in the playoffs when he averaged 17.6 points and 5.3 assists in Zalgiris's three wins against Olympiacos Piraeus. The only player to start every game for Zalgiris, he stood tall as the team's floor general and the true extension of head coach Sarunas Jasikevicius on the court. For all those reasons and more, Pangos was chosen to the All-EuroLeague team for the first time in his blossoming career. In his first season back in the Turkish Airlines EuroLeague, Sergio Rodriguez of CSKA Moscow set career bests in scoring and three-pointers made en route to his second All-EuroLeague selection. Rodriguez was named EuroLeague MVP and to the All-EuroLeague First Team with Real Madrid in the 2013-14 season and his production this season is similar to what he recorded then. Rodriguez earned MVP of the round honors for the first time in his career when he posted career-highs of 26 points and a PIR of 36 in CSKA's win against Khimki Moscow Region in Playoffs Game 2. His PIR was the best in a playoff game this decade and his point total was the highest for a winning player in a non-overtime playoff game since 2010. 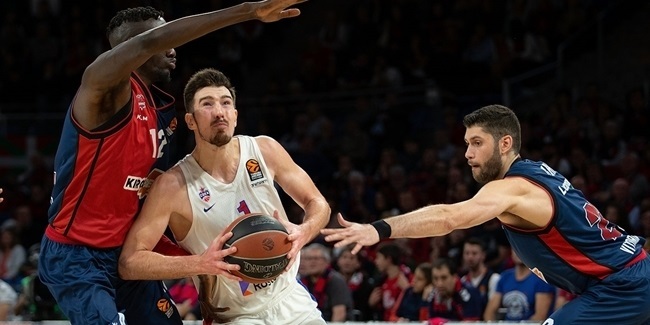 Rodriguez stepped up when his backcourt partner and star guard Nando De Colo bowed out of the playoffs due to injury and led CSKA to the Final Four by ranking second in the playoffs in scoring (19.3 ppg.) and PIR (22.8) and third in assists (6.5 apg.). For the season, Rodriguez posted career-highs in scoring (14.1 ppg.) and his total of 90 three-point shots made is the second highest ever. He delivered excellent shooting percentages from all distances (59.1% 2FG, 44.6% 3FG, 89.7% FT), too. The playmaker also ranked ninth in the competition in assists (5.0 apg.). At age 31, Rodriguez is at the prime of his career and proving it on the court. This season Alexey Shved made history by smashing several competition records, all while leading Khimki Moscow Region to its first-ever EuroLeague Playoffs appearance. Shved set the single-season record by scoring 740 points this season and scored at least 12 points in each of his 34 appearances. Consequently, Shved won the Alphonso Ford Top Scorer Trophy with 21.8 points per game, which is the highest for a player with 20 or more games played since the late Alphonso Ford posted 24.8 in the 2001-02 season. The Khimki guard also smashed the EuroLeague record for most three-pointers in a season by netting 107 triples. Shved then broke EuroLeague Playoffs single-game records in the current format when he netted 36 points and knocked down 8 threes in Game 4 against CSKA Moscow. The EuroLeague MVP for February, Shved's four MVP of the round honors this season tied for most in the league. He led the competition in minutes played (32:12), finished second in average PIR (20.4), was tied for fourth with 1.3 steals per game and ranked sixth with 5.2 assists per contest. Shved, who made his EuroLeague debut as a teenager more than a decade ago, helped CSKA Moscow win the 2008 EuroLeague title. 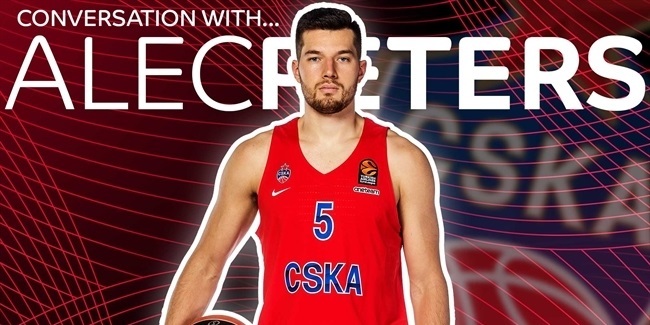 Last season he was the 7DAYS EuroCup MVP and this season he becomes the third former EuroCup MVP – along with Nick Calathes and Andrew Goudelock – to be named to the All-EuroLeague team. Olympiacos Piraeus superstar Vassilis Spanoulis has been chosen to the All-EuroLeague team for a record eighth time. The veteran guard helped Olympiacos to a third-place regular season finish by leading his team in scoring (14.0 ppg. ), assists (5.6 apg.) and fouls drawn (4.5 per game). He ranked fourth in assists this season and took over first place on the all-time standings in the category with 1,287. Spanoulis was MVP for Round 23 of the regular season after torching Valencia Basket for 25 points and 9 assists. What's more, Spanoulis's offensive prowess came on a team that is noted for having one of the league's best defenses. He shined in the most important games of the season; Spanoulis was tied for fourth with 18.8 points per game and ranked fifth with 5.3 assists in the playoffs, even though his Reds fell in four games to Zalgiris Kaunas. Spanoulis will turn 36 this summer and just finished his 12th EuroLeague campaign, but is not showing many signs of slowing down. His scoring average this season was higher than his career average (13.5 ppg.) and his best two seasons sharing the ball were the last two The three-time EuroLeague champion and Final Four MVP missed the first 10 games of the season to injury, but once he found his rhythm, Spanoulis was as unstoppable as always and averaged 17.3 points and 6.1 assists over his team's last 12 games.